Situated on the isthmus between Central & South America, the country of Panama is famed for its impressive canal, which slices through the centre of the country, linking the Atlantic and the Pacific Oceans; it is considered an amazing feat of engineering and an essential shipping route which allows ships to pass between oceans without having to travel around the bottom of South America. 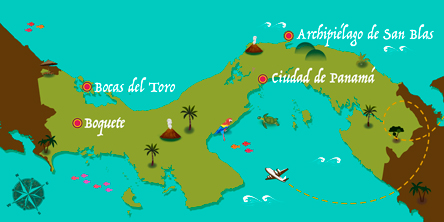 Panama shares borders with Costa Rica and Colombia and is known to have many cultural influences from the Caribbean. A population of 4 million calls the country their home, half of which live in the capital, Panama City. This capital city is a metropolis of skyscrapers, although it has successfully retained parts of its old-world charm, seen in its historic Old Quarter. The cityscape contrasts with the jungle which covers an impressive 40% of the country and aside from the big cities and jungles, Panama has various beach and island destinations including the San Blas Islands and Bocas del Toro, at the tip of Isla Colon in the Caribbean Sea, known for its wildlife and Star Fish Beach. The town of Boquete, situated on the Caldera River, is another destination to visit on a tour of Panama for its coffee plantations and hiking trails. The country has a long and diverse history and a holiday to Panama is the perfect way to learn about the country’s story. Before Europeans arrived in the 14th century, Panama was populated and settled by various groups of indigenous people such as the Cueva, Chibchan and Guaymí people. Because of the country’s prime location between two great continents, it has historically been home to a wide mix of people, ensuring that Panamanian culture is a rich and colourful melting pot of traditions and beliefs. With the arrival of colonist and Spanish conquistadors, Panama grew in importance as an essential crossroads and marketplace for Spain’s empire in the New World. The Spanish influence on the country has left its mark in the architecture, culture and language, although deadly infections, brought from Europe, tragically killed a large proportion of the indigenous population. After Spanish rule ended in 1821, Panama was closely tied to its Colombian neighbours, until it became independent in 1903. The USA later collaborated with Panama to begin building the iconic canal, which was completed in 1914. Owing to its unique position between continents, Panama has a wonderfully diverse landscape, ranging from volcanic jungles to white sandy beaches. The Cordillera Mountains form a central spine through the country and the tallest mountain, Volcan Baru, is an impressive 3475 metres high. The country’s main river is the River Chagres and the general climate is tropical, with little seasonal variations throughout the year. Panama is famously one of the most biodiverse places on earth, home to a wide array of animals such as jaguars, pumas, colourful frogs, wild cats, sloths, hummingbirds and parakeets, and its coastline is known to be a great place to witness the migration of humpback whales between July and October. With numerous national parks in which to witness this biodiversity, a package holiday to Panama is the perfect choice for nature lovers. The Parque National Metropolitano, located close to Panama City is a good place to start, and the Boquete Cloud Forest offers visitors the opportunity to see the elusive Quetzal bird in the wild. Another unmissable nature reserve is the Darien National Park, home to amazing wildlife and hidden inside the infamous Darien Gap Rainforest, an impenetrable territory separating Panama and Colombia. Panamanian culture is a fabulous mix of African, Native American and Spanish influences, with a big focus on dance, folklore and music, such as jazz, blues, reggae and salsa. For an insight into the most authentic culture of Panama, untouched by outside influences, the region of Guna Yala is home to an indigenous community known as Gunas who still practice many unique indigenous traditions unseen elsewhere in the world. Of course, the iconic woven straw hat is a traditional symbol of Panama’s culture that is widely worn by local men, whilst the ‘Pollera’ is the typical dress worn by Panamanian women. Families are at the heart of Panamanian culture, as is maintaining a rich social life, as seen in action in the busy cafes and bars throughout the major cities, where friends and family can be seen sharing drinks and hearty meals together. A holiday to Panama will open your eyes to a friendly and laid-back culture where you can happily sit on a cafe terrace or along the boardwalk and watch the world go by. If Panama has caught your attention, leave us your number so we can call you to discuss the voyage that awaits you.